At the top of Lester Road in London’s East End stands ‘Paddy’s Castle’, the three-storey, red-bricked Georgian house that is home to Grace Donnelly and her family. Life may be hard in the late 1930s, but it is nothing compared with what is about to follow. Grace’s beloved fiancé Stanley decides to enlist in the fight against Nazi Germany. And as the sirens signal blitz after blitz of bombers, the family can only hide in the cellar and hope they will survive. A classic World War Two saga, Fur Coat, No Knickers is a perfect read for fans of Carol Rivers, Sally Warboyes, and Annie Murray. I love the way, Anna King, writes her books. 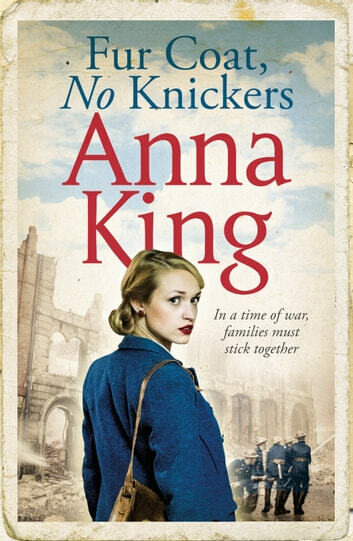 Anna King, writes in such a way, you feel you know the family, and each character in the family. It was a great book, with such appalling adversity this family had incurred during WW2. I like the twists and turns in this book.